Our research spans virtually all areas of modern chemical research and related fields. Our PhD program features internationally recognized research and a small student/faculty ratio. Pursue a degree or take courses in chemistry. Undergraduates can consider our five-year BS/MS degree program. From research opportunities to coursework, undergraduate students can make the most of the summer semester at Rochester. Graduate students in the chemical and biological sciences at Rochester have the opportunity to participate in the NIH-funded Chemistry-Biology Interface (CBI) Training Program. Thirty faculty members from six departments and programs in AS&E and SMD serve as mentors to students participating in the program. 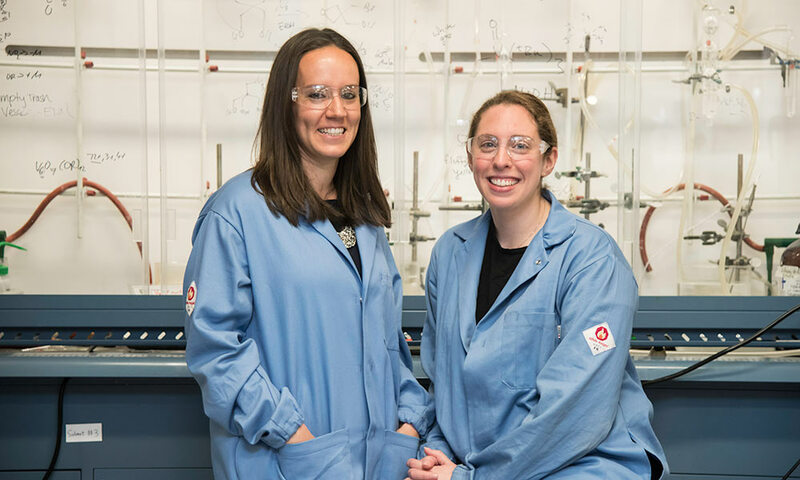 The lab of Ellen Matson (left), an assistant professor of chemistry, has developed a new method of opening solid state materials to oxygenation, using metallic oxide clusters, which can eliminate guesswork from discovery of new catalysts. The ultimate goal is to more efficiently convert greenhouse gases to useful fuels. PhD student Brittney Petel (right) is lead author of the paper describing the discovery. Want more information about the Department of Chemistry? Contact us. Follow us on Facebook at www.facebook.com/UofRChemistry.